How can a service exchange data with consumers that use different communication protocols? 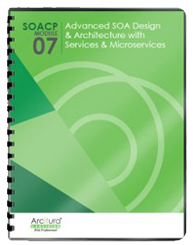 Services using different communication protocols or different versions of the same protocol cannot exchange data. Bridging logic is introduced to enable communication between different communication protocols by dynamically converting one protocol to another at runtime. Instead of connecting directly to each other, consumer programs and services connect to a broker, which provides bridging logic that carries out the protocol conversion. Significant performance overhead can be imposed by bridging technologies, and their use can limit or eliminate the ability to incorporate reliability and transaction features. The consumer programs interact with a middle-tier broker that provides protocol bridging features. 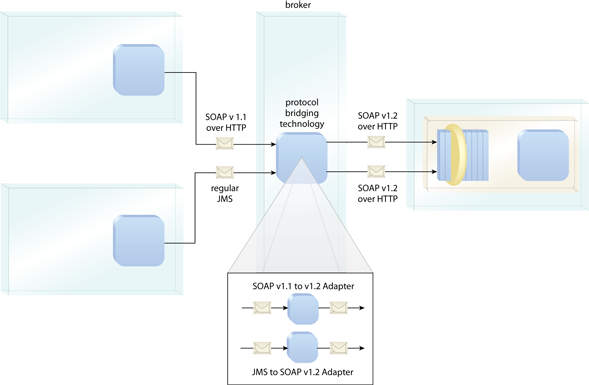 Separate protocol adapters are used to translate the two incompatible protocols to the required SOAP version 1.2 over HTTP. The broker then transmits the messages to the service on behalf of the consumers.